ExtensionEngine Blog Online Learning Gap? A Problem with a Solution. Online learning is a tool. It can be used to address the needs of any group of learners. If helping less proficient students reach their potential is a goal (and it should be), online learning can be designed to achieve that goal. Today. The problem is not with online courses per se, it’s with the design of most online programs. Just as many large, in-class lectures don't support the needs of less proficient students, most of today’s online programs are built as extensions of their on-campus classes and, therefore, achieve the same results. Most schools anchor their thinking about online learning to their existing on-campus courses. This approach is limiting at best, and a recipe for mediocrity in many cases. Instead of thinking about a new online initiative—whether it’s a single course or an entire degree program—as a generic rework of an on-campus course, we must approach it as an entirely new educational experience. One that embraces adaptive learning techniques and demands that we evaluate all the requirements and ensure the program is designed with specific learners in mind. 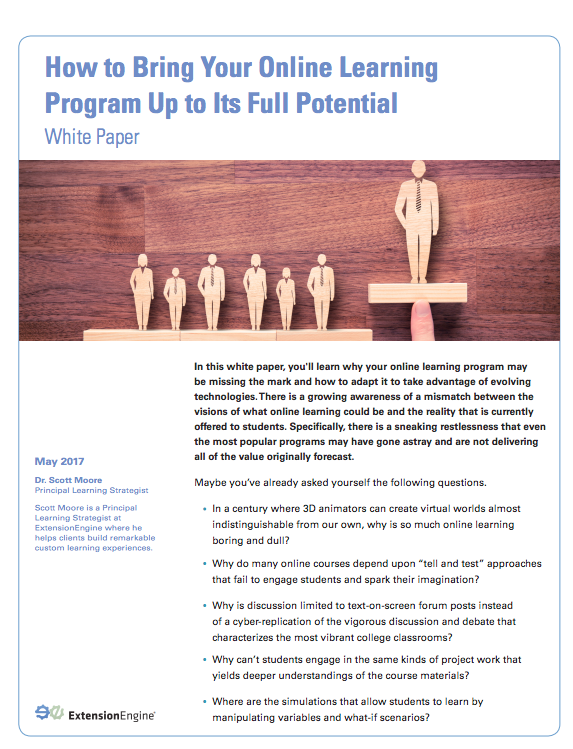 Online learning experiences that embrace learner variability can be designed to be engaging, differentiating and produce great student experiences and outcomes—for those with strong academic skills as well as less proficient students. A learner-centric approach leverages the latest techniques in learning science and advances in technology to foster learner engagement and create opportunities for collaboration and active learning, thereby resulting in more impactful learning experiences. It puts the learner and the pedagogy of the institution at the forefront of course design decisions. Digital learning experiences offer universities and faculty the opportunity to open the black box of student learning. Instead of offering course materials and waiting for students to ask for help, instructors can utilize formative assessment tools to get greater clarity on where students are struggling and then offer targeted support. Online learning can also break down the time boxed nature of student support. Students can receive instructor help via just-in-time video conferencing, or reach out to peers for guidance through chat tools. Furthermore, learning moments themselves can be designed with support for struggling learners in mind by offering suggestions for further explanation or assistance as part of courseware. This concept of human support in online learning is an important one. There are few scenarios in which a learning experience can be fully automated and asynchronously delivered. In fact, I would argue that especially in situations where there is a mix of academically advanced and challenged students, purely asynchronous learning is not the right fit. Frequently, when online learning falls short, the experience has been designed without regard for the students’ needs. In these instances, the instructor has usually just taken an in-person course, shot some video, created some slides and thrown it up on Blackboard, Canvas or some other LMS and called it an online course. Learner needs should be the primary consideration and the learning experience should support those. It’s crucial that we are asking the right questions when developing online courses. We have to ask the right questions and ensure we are taking a pedagogy-driven, learner-centric approach to achieve the right solutions - for all students. This white paper will help you understand how to adapt and take advantage of evolving technologies.